Today, we tend to think of most rings as being mere decoration for our hands. Of course, there are some rings – engagement, wedding, eternity, etc. – which have a far more symbolic meaning. Amongst the symbolism is certain traditions, perhaps even rules, that go with their wearing. But, as time moves on, many traditions change. Wedding bands are thought to have originated in ancient Egypt, around 3000 BC. The first bands were made from grass or reeds which were twisted and tied to make a ring. 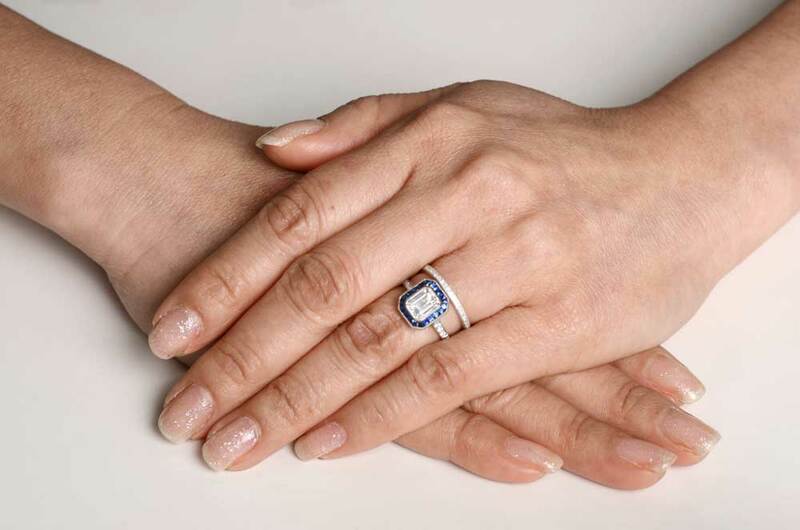 The symbol of the ring is to produce a circle which has no end, showing lifelong commitment. Being made from such fragile materials, the bands were very short lived. This wasn’t such an important consideration for the ancient Egyptians, for whom the giving was the most important thing without too much focus placed on the physical longevity of the ring. The placing of the ring on the finger also had great meaning. 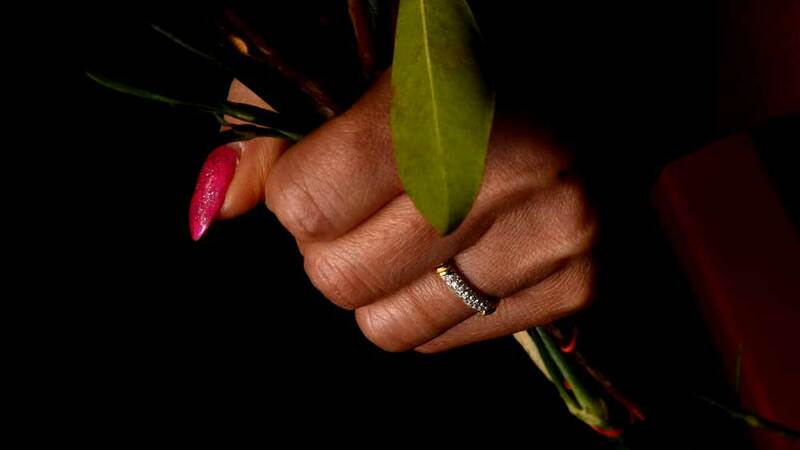 By a woman agreeing to put her finger through the ring, it meant she committed to a life and destiny as yet to be determined. It was a symbolic gateway through which both partners had to step in order for the relationship to become “official”. This, of course, is still the case today when we present a wedding band during the ceremony to signal our everlasting commitment to the other person. It took thousands of years for the custom to switch from being a single ring presented to a woman, to the exchange of rings we know today. With the rapid expansion of Western Culture through Europe in the middle ages, the exchange of rings quickly became the “new” tradition. Despite this, the UK, US, and Canada waited until the early 20th century to follow suit. As young husbands went to the “Great” War, they started to wear rings as a reminder of the women they were leaving behind. This evolved into the changing of wedding bands. 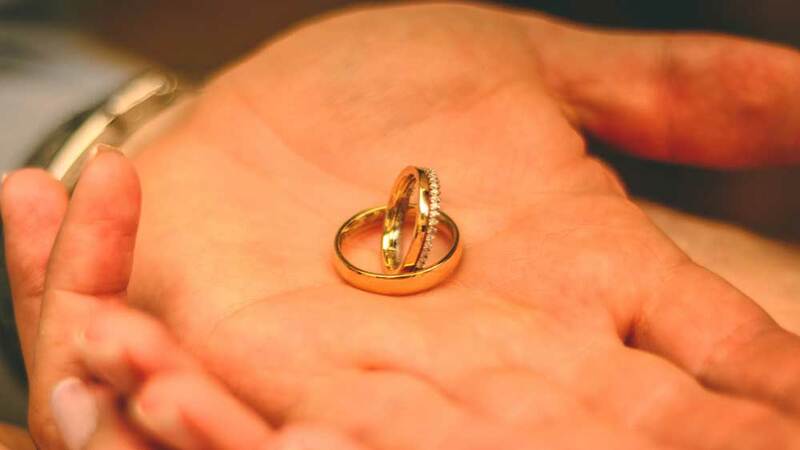 Although most religions and cultures have some form of ring-giving or exchange, it is usually only western cultures which incorporate the occasion into the wedding ceremony itself. Many others make no distinction between the giving of an engagement ring and a wedding band. The giving of the ring in these cultures happens only once, often before the wedding itself. We have five fingers, or four and a thumb, on each hand. And yet we choose to designate the fourth finger of our left hand as the ring finger. So why is that? Legend has it that the ancient Romans believed that the ring finger had a direct connection to the heart. 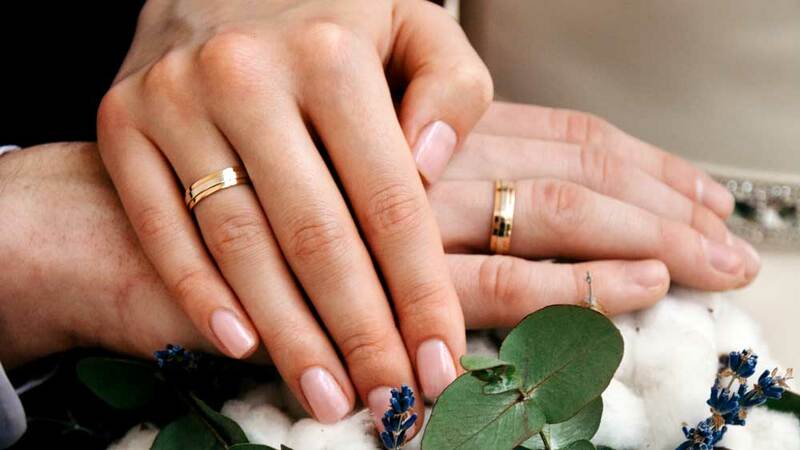 By placing a ring on this finger, the hearts of each person also became forever connected. Romantic? definitely but physically accurate? Sadly not. But it doesn’t stop us putting at least two, maybe three, rings on that very same ring finger. But in which order should you wear them? Chronologically, of course, the engagement ring is first on, followed by the wedding band. But tradition determines that the wedding band should always be worn closest to the heart, and so needs to somehow finish up in the first position on the finger. There is also a practical reason for doing so. 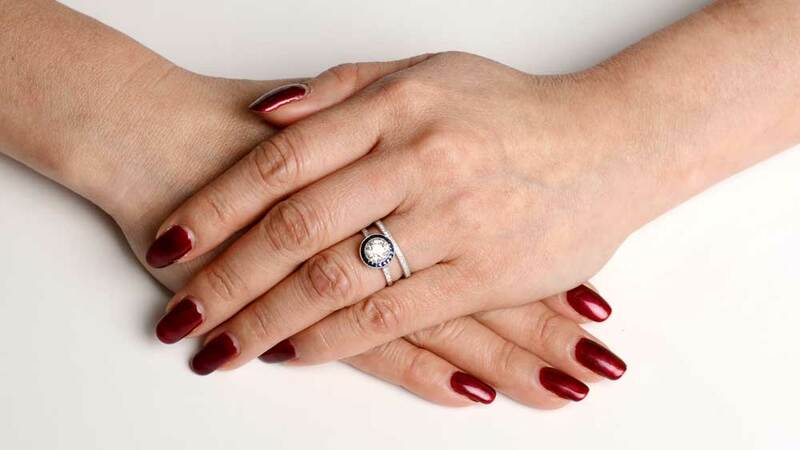 You are far more likely to wear your wedding band 24/7, but it is likely you will remove your engagement ring pretty regularly. Fortunately, someone already thought about this. A simple and elegant method of ending up with the correct ring in the correct place on your wedding day was devised long ago. Read More about Engagement Ring Placement. Placing the wedding band on the fourth finger of the left hand is a tradition, not a law. 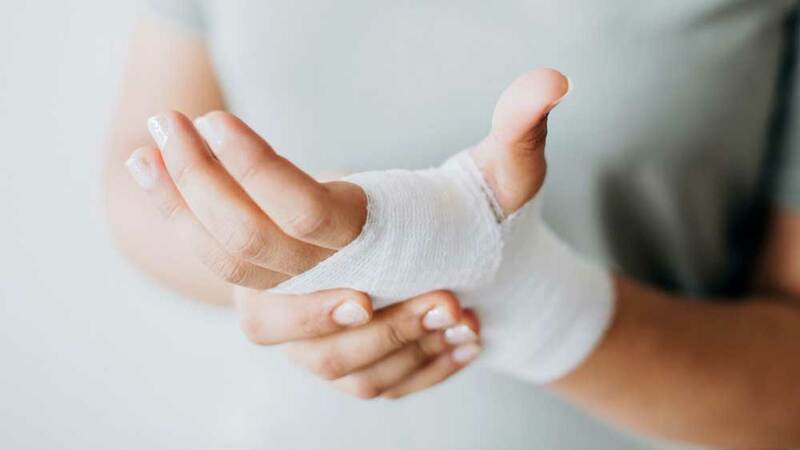 It’s a nice tradition, and one which is nice to observe, but you may have compelling reasons for switching fingers or even hands. We do almost everything with our hands. We use them all day, every day, for tasks ranging from the most menial to the most complex. This makes it inevitable that we will occasionally damage them. At that point, it may be necessary to move your wedding band from your ring finger. You can, if you wish, remove it altogether until such time that you can wear it comfortably again. Or you could simply move it to another finger. As we say above, the wearing of a wedding band on a particular finger is a tradition. Neither the band nor your marriage loses any importance if you ever move or remove it. Some cultures, particularly in Eastern Europe for example, wear the wedding band on the fourth finger of the right hand. This doesn’t mean that you are observing other traditions, necessarily, if you do the same. But it does mean that you won’t be alone if you need to wear your wedding band on a different finger for a while. It may also be that you suffer an allergic reaction to the metal in the band. Although the vast majority of wedding bands are still made from yellow gold, things are changing. Adverse reactions, such as contact dermatitis, to yellow gold is extremely rare, but it can happen. Platinum is similarly easy going on human skin. But, as we move towards using metals such as white gold more frequently, we see more of these issues arising. White gold can contain nickel, which is notorious for causing skin irritation. Although many manufacturers have abandoned nickel for more skin-friendly alloys, you still need to be careful when choosing your wedding band. Of course, switching fingers isn’t going to solve the problem. Short of buying a new ring, you may be short of too many options. What some people do, in similar situations, is wear their wedding band on a chain around their neck. Although the risk of a reaction is still present, it is not as big. A ring on a finger is in constant contact with the exact same area of skin on an almost permanent basis. Wearing it around your neck means that the contact period for any small section of your skin is much shorter. It might not be a perfect solution, but it’s worth a try. Not so very long ago, we all bought wedding bands by making a trip to a jewelry store, having a jeweler measure our finger and then buying the ring. Today, with the internet, we have many more options. The problem, of course, with buying online is that you don’t usually get to try a ring on for size. 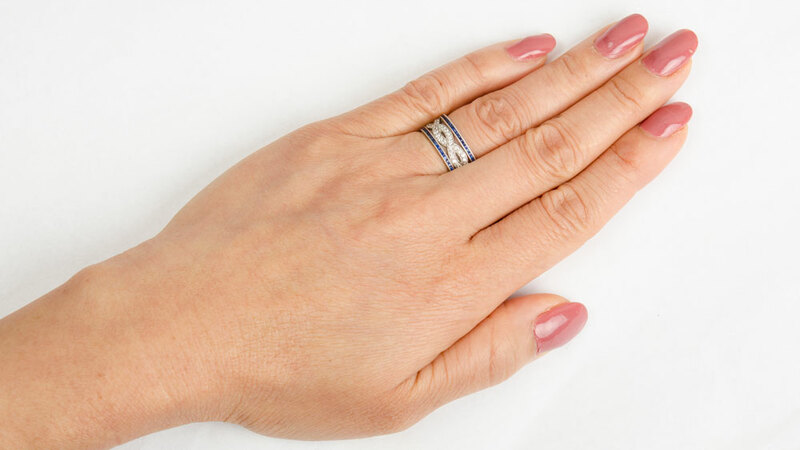 Fortunately, there is now an easy way to measure your finger for any ring, not just a wedding band, and buy online in the knowledge that the ring will fit when it arrives. Although you can, technically, use a piece of ribbon or string to measure your finger, and then use a scale to get a ring fitting, you’re still making it more difficult than it needs to be. We have produced a quick and very simple guide on how to measure your ring size accurately and quickly. You can also buy a cheap ring sizer from Amazon.